Come fly the skies of WW1, in Red Baron 3D! When men were made of steel and planes were made of wood! Hear your opponent grunt if wounded or scream if you shoot him in the head. Have your wings pop off if you overstress them, black out if too many G's are pulled, deal with gun jams, all the while looking at your opponent from mere feet away. Learn to take advantage of each planes strengths or weaknesses and how to exploit your enemies'. Whether you live or die an honorable 'Salute' is given. 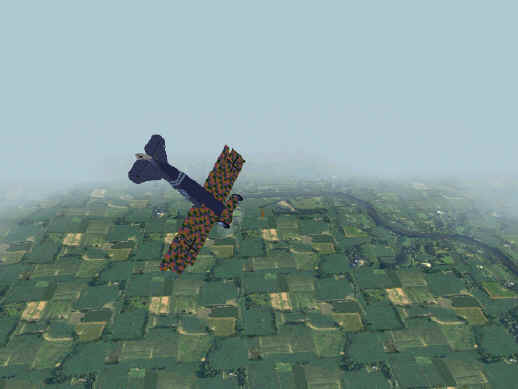 Red Baron a WW1 flight simulation that has been around since 1992 RB, 1995 RBII, 1998 RB3D. There are approximately 700 players who play RB3D in over 50 squads? On average you will find 30 to 50 players online at any time of the day or night from all nations and backgrounds, as well as 30-40 servers of all descriptions and FMs. You can either join a squad or fly as an independent. You will need the 1078 patch to see servers online. Available here. Also if you have RBII get the super patch here. For best graphics it is best to have a voodoo card. Either direct or by using a voodoo 2 with SLI patch through cable. But it works fine in 'Glide' or 'Direct Draw', just the graphics are a bit poor until you install the terrain patches. There are some glide wrappers out there which are being improved each day. This one is about 95% perfected. Visit http://www.glidos.net/baron.html. Does present some problems, its nothing that hasn't been addressed in this document. http://www.wings-of-valor.net/files/documents/xpworkarounds.pdf Also you may run into some other problems which need to be addressed on an individual basis due to hardware. These are best addressed at the WOV forum everyone will be glad to help you. 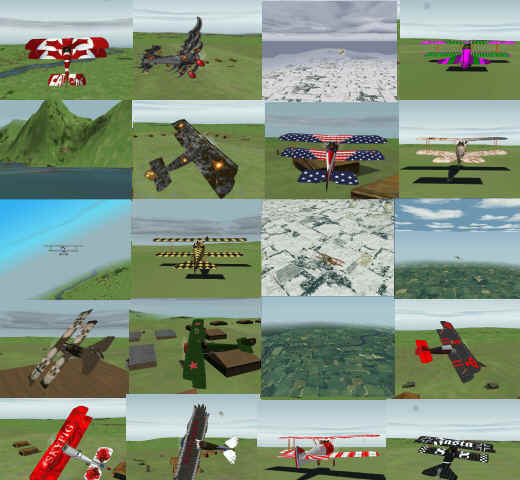 Since its release over 2900 paints either for squads or freelancers have been created and are available for use at either http://www.flybert.net/ or http://www.rbwarpaints.com/ With 22 planes and 190 paint schemes available to be created and used either for personal or squads making a whopping 4180 total paints available. Plus some of the new patches have added other planes boosting the number available. KFM weird and wacky Flight Model. I don’t know of a link? Panama Red Don't know of link? This is the default directory for patches. Any file put in here will be used ahead of all other files, in both single and multiplayer games. Files in Simpatch are used ahead of the same named file in Shellpat for SP; however, files in Multi will over-ride Simpatch for MMP. This directory is only used by the single player game, so it is a good choice for e.g. flight and damage models, which will get you ejected from a server in MMP if you have changed them from stock. It is also a good choice for any date based patches, otherwise you will get some weird results in MMP. I had a lot of allies flying Siemens-Schuckerts at one point. This directory is only used by the game for MMP. It over-rides Simpatch. This directory operates in much the same way as Simpatch, and is mainly used for 3D shapes and terrains. I don't really know why it is there; I use it solely for terrains. Though it works in both SP and MMP, I'm not sure if it over-rides the Shellpat and Multi folders or not. Read the read me info in any patch this is just a brief explanation of the patching folders and what they do. Campaign Manager required for some patches like WFP read the read me or FAQ on patches site. There are a number of organized events available for squad members or mercenaries either in Normal Flight Mode NFM or Advanced flight Mode AFM plus an additional selection of modified FM's DM's FIF, KFM and GW to name a few. If you like co-op RB3D is the place to be. There are too many others to mention them all, not to mention all of the individual squadron challenges. You can either run your own or join in with others. The possibilities for server setups are limitless. You have a choice of two Flight model’s Advanced FM or Normal FM (not to mention all of the newly created FM's KFM, FIF, WFP etc). Each FM has three different settings Novice, Veteran. or Ace. There are four different server types. Melee, Team melee, Team Target melee, or Get the Baron where you can choose the number of barons at will. Also Rens has created a new Real Front server RFS for balloon busting. You will also find a new security enhancement at Rens site it is required for some servers. You can add or subtract targets to create a map of your choosing or select from the different target densities settings of sparse, medium, dense or full. You also have a choice of 4 map sizes small, medium, large and full. With 4 maps too choose from Island, Alsace, Flanders, and Marne. You can set up progressive wars by date or if you like have all planes available. No longer need to bomb in turn. New server logging program records all destroyed targets. New server log distiller easily allows you to correlate scores. There is a great server setup utility here at http://www.wings-of-valor.net/servermanager/index.htm with graphical interface for ease of use.